2 Bedroom Terraced House For Sale in Bournemouth for Offers in excess of £230,000. 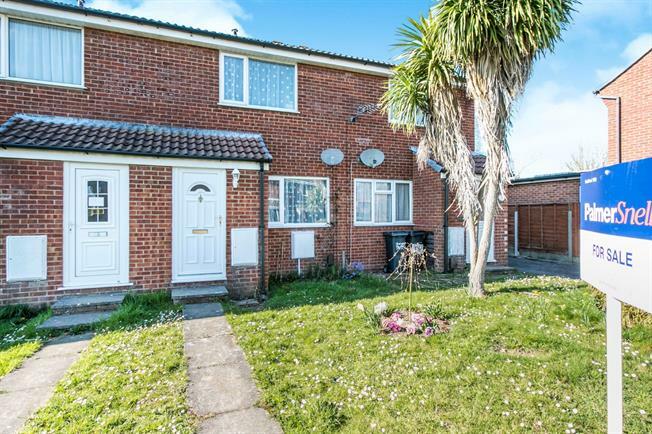 OPEN HOUSE THIS WEEKEND VENDOR SUITED - Palmer Snell are pleased to offer this 2 double bedroom terraced house situated in a quiet cul-de-sac in Throop close to Castlepoint, the Grammar Schools and Muscliff. The accommodation comprises a porch, 16'8" lounge/diner, 12'4" kitchen/breakfast room, 2 double bedrooms, bathroom, UPVC double glazing, gardens to the front and rear and off road parking. Via UPVC double glazed door. Storage cupboard. Door to lounge/diner. UPVC double glazed window to front aspect. Gas fire. TV point. Stairs to first floor. Space for table and chairs. Door to kitchen/breakfast room. UPVC double glazed window and door to rear garden. Range of wall and base units. Breakfast bar. Sink. Space for appliances. Tiled walls. Loft hatch. Doors to accommodation. UPVC double glazed window to front aspect. TV point. UPVC double glazed window to rear aspect. Airing cupboard housing tank. WC. Wash basin in vanity. Bath with shower over. Tiled walls. The front of the property is laid to lawn with a pathway leading to the property. The rear garden has a patio off the property with the remainder laid to lawn. Shed space. Gate to the parking area. Allocated off road parking at the rear. Scope to create further parking in the front subject to a drop curb.